Hurricane Wilma – Distant Memory or Timely Reminder? The sign in front of the Ramada Inn Hotel in Pensacola, Florida stood on a pole about fifty feet off the ground. The manager at the front desk told us not to worry—it had withstood Hurricane Ivan the year before. That’s nice I thought, and proceeded to tell the camera crews not to park underneath it. Turned out that was good advice. It was July 2005, the morning of July 10 to be exact. 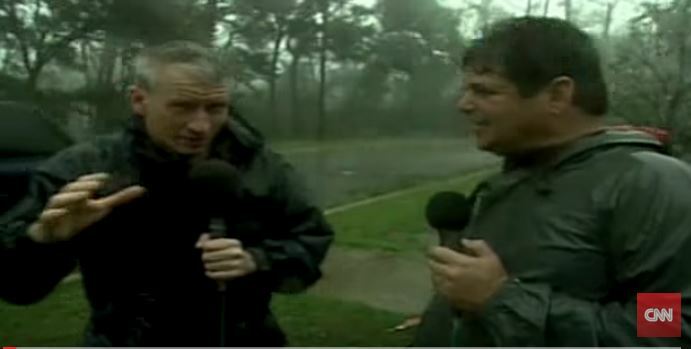 Anderson Cooper and his team had just rolled in from Panama City where one on air personality is reported to have said as they left, “dead men walking!” I guess that phrase is appropriate anytime you are planning to stand out in the middle of a hurricane. Cooper and I would tag team this one together. That afternoon hurricane season 2005 kicked into gear, high gear as the “D” storm Dennis came ashore. As the storm hit, we huddled against a wall at the corner of the hotel. The wind blew, pine trees snapped and guess what, that Ramada Inn sign that had survived Ivan started spinning like a top, flew off its mounting, and crashed down in the parking lot. Chunks of razor sharp aluminum went airborne. Anyway, the video evidence of our “dead men walking” moment is still all over YouTube. Of course, no one had a clue that Dennis was just foreshadowing worse storms to come, life altering events from Katrina to Rita and finally Wilma. So here we are approaching ten years since Wilma hit South Florida. And that means ten years of relative calm here, ten years of tropical tranquility. My season of the sto rms had started with “D” and ended with “W.” Wilma, you may recall, had at one point 175 mile per hour sustained winds and the lowest barometric pressure ever recorded in the Atlantic Basin. It hammered the Yucatan Peninsula as a category four hurricane. Then it took a right turn, accelerated to the east, and made a beeline towards Florida. Anderson and I were again joined at the rain slicker for Wilma. He emailed, asking where I thought we should be. I suggested Marco Island on the west coast close to where most folks thought it would make landfall. I was pretty close. The storm came ashore near Naples as a Category three hurricane. We were near the center of it. The eye took a good hour to pass over us on the morning of October 24. We stood out on the beach for this one. No Ramada Inn sign to worry about! But, while I was right about landfall, I was really, really wrong about where the worst impact would be! The west coast made out pretty well, but the reports out of Broward and Palm Beach Counties on the east coast were not good. My own home in the town of Davie near Fort Lauderdale took a pretty good punch. Since I’m not a meteorologist I will spare you the meteorology. Why it did what it did is a good read from the real experts at the National Hurricane Center. For me, Wilma is the poster storm for why it’s critical to be prepared even if you don’t think you’re in much danger. We left Marco Island at lunchtime and headed east across I-75. As we drove, I tried reaching my wife Robin, but the cell phone lines were jammed. I wasn’t terribly worried about my house. I had shuttered all the openings before leaving for Marco and we had a Miami-Dade hurricane code garage door. I knew my family would be safe. And, as a journalist who covered hurricanes I would have looked like an idiot if I hadn’t taken all the precautions to protect my home. We had plenty of food on hand too. “What a mess”, was my first thought as I entered our neighborhood. Trees were down, power out and roofs were damaged. A gas grill ended up at the bottom of our friend’s swimming pool, later to be recovered by my sons and their friends who made considerable money in the days after cleaning up debris. My family was just fine. But my wife warned that while the house looked good from the front, the back, well, not so much. There was a huge pine tree down by the lake. It snapped at the base but no, it couldn’t fall harmlessly into the lake, it had to fall on the screened enclosure over the pool. The enclosure crumbled and Wilma’s winds threw some of the beams onto the roof raking the tiles. There wasn’t much I could do about any of this at the moment. Overall, it was just cosmetic damage. Close to six figures worth, but we were fortunate. And, I still had to work. That night Cooper and I were on the Larry King show. Much of Broward County and parts of Palm Beach County were a mess. Here’s one of the great Wilma ironies. Florida prided itself on being the best prepared for hurricanes. Yet less than twenty-four hours after the storm, thousands of people were lined up for water and ice. Most gas stations were closed because they didn’t have generators. CNN sent in a fuel truck to keep us going. One hundred thousand people waited in lines for emergency food stamps. Some six million people were without power. If you didn’t have a generator you were in trouble. One of our friends living in Atlanta drove down with a couple for their family here. But, even if you had a portable generator, you couldn’t get fuel. A neighbor loaded gas cans in his truck and drove to Fort Myers to find it. At the time I remember wishing I had a standby generator that can run for more than a week. I do now! So Wilma became known as the Urban Storm because it took out so many trees that took out so many power lines. Some people were without juice for close to a month. Ours came back on Halloween afternoon, eight days after Wilma hit. There was one bit of good fortune. The cold front that forced the hurricane to turn right and race across Florida pushed through right after the storm exited bringing cool, bearable October weather. One woman bought thirty, I’m not kidding, thirty lanterns. An author even wrote a book called the “Storm Gourmet Cook Book,” how to prepare good meals without power. It sold out just in time for Christmas. It has now been a decade since Wilma and a decade since South Florida has been hit. You have to wonder with so much time for complacency to set in, would the result be any different now? Or would we again be Christmas shopping for propane stoves and storm cook books? This entry was posted in Uncategorized and tagged flash.org, flood, florida hurricane, hurricane, hurricane wilma, john zarrella, storm, wilma by federalalliance. Bookmark the permalink.